Azure - Do I need other roles than Worker Role for a web site and service layer in Azure? Do I need other roles than Worker Role for a web site and service layer in Azure? I've deployed web sites and services to the cloud before but it was a while ago and I wanted to revisit my approach to inventorize my skills. During the research, I've been told to use a worker role but I'm not sure in what constellation to apply it. The image presents my choices. I'll be setting up two things (preferably on the same base URL). Do I need all the three of them? Or is it perhaps so that Worker Role covers the others? Or are the others sufficient and I need to Worker Role? Or am I totally confusing the concepts here? 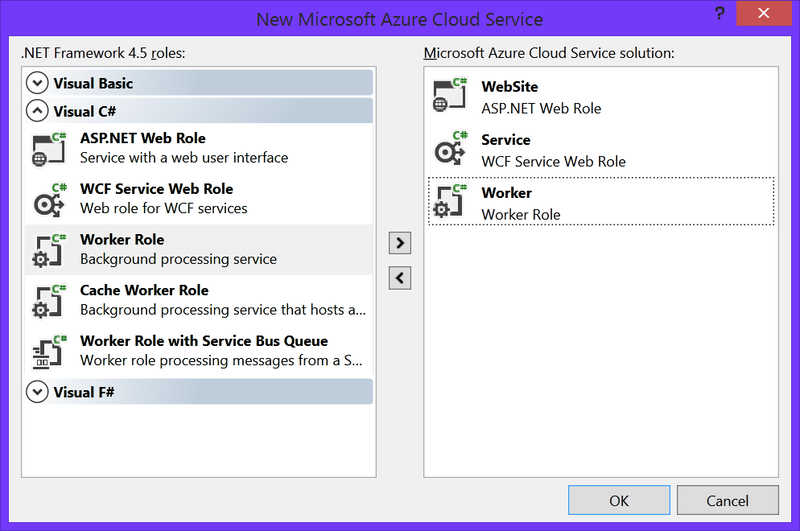 A web role is essentially a Worker role with IIS installed + configured. You could host a WebApi/MVC, WCF AND process events all from the same web role if you really wanted to, reducing costs. Remember that each role is a separate VM that you have to pay for, so adding extras roles to keep everything separate may not always be the best idea. In one of our projects for example, we use a web role to host a WebApi. A Worker role to process internal events, and a worker role to host WCF services (you can also use a web role for this). We split them because they take very different workloads and perform separate functions, so being able to scale them independently made sense.